I’m not sure if there’s a more satisfying dish than a burger. The combination of soft roll, flavourful patty and tangy sauce just hits the spot — every time. Add crispy chips to that, and you have a winner of a meal. 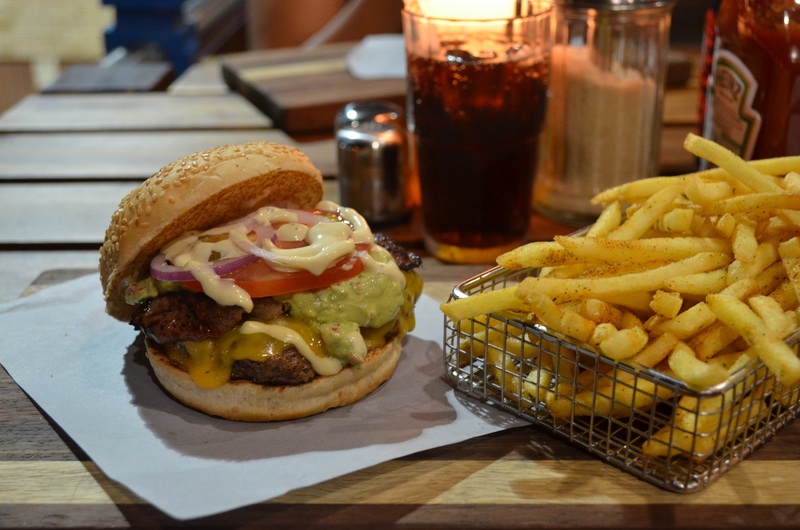 Jozi has a good variety of premium burgers, so instead of going to a generic fast food joint, here are five slightly more upscale places to get your fix. This diner offers “smashburgers” and wings, nothing else. The smashburger trend started in the US and refers to the process of using a piping hot grill to seal in the juices of a smashed ball of ground beef, leading to a medium-well done burger that is super juicy. 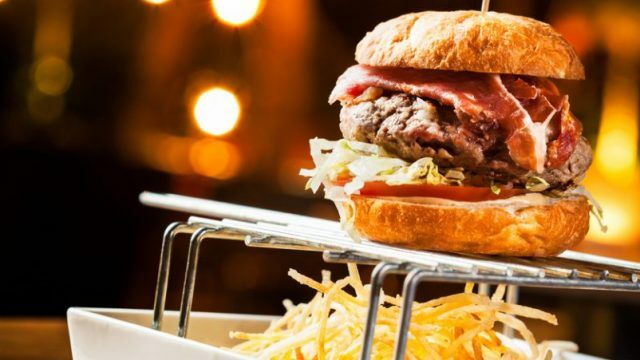 Rocomama’s‘ signature burger is the “BaconCheeseGuac,” which comprises 150 grams of smashed beef, bacon, fresh guacamole, tomato, red onion and “rocomayo,” finished off with a small portion of shoestring fries. The restaurant has limited informal seating, but it fills up quickly so it may be better to opt for a takeaway. Definitely the best value for money option on this list. Open 7 days a week, 9am until late; various locations around Johannesburg. If you’re really, really hungry, this one should be your pick. Oversized concept burgers are Duke’s specialty, the flagship choice being “The Duke”- a hearty beef patty with grilled pineapple, mushrooms, fried tomato, sunnyside-up egg, crispy bacon, cheddar cheese, gherkins, cucumber ribbons and onion rings. It’s correct to assume that you most likely won’t have space for dessert, which consists of one option–the pie of the day. 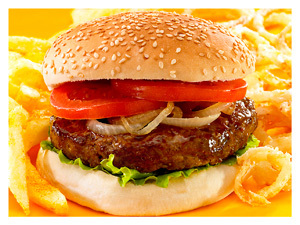 Burgers are served with your choice of side–the selection includes some healthy options like sweet potato chips. 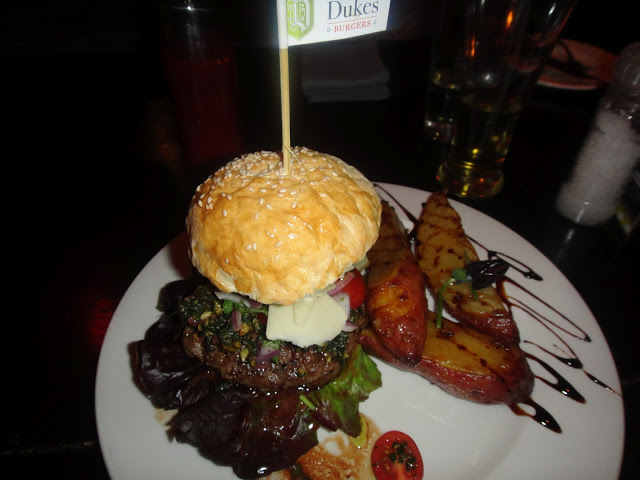 Duke’s prides itself on making everything from scratch–burger patties are made in-house and buns are baked on the premises. 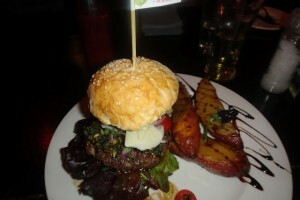 Vegetarian burgers are prepared separately and even wheat-free buns are available–really something for everyone! Gourmet Garage has been around for a while, and has burgers down to a fine art. With funky decor reminiscent of an old school diner in the US, it’s is a popular place to watch your favourite sport on TV while chowing down on some gourmet “pub grub.” You can’t go to Gourmet Garage and not order the works: fries, onion rings, and if you really want to indulge, a milkshake. The “garage” theme is taken quite literally, and you’ll find novel items like old-school petrol station posters adorning the walls. 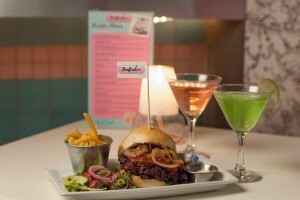 The restaurant is also able to cater for private functions. If you’re in the mood for something a bit more casual, head to the hugely popular Market on Main, which happens at the vibey Maboneng Precinct every Sunday. 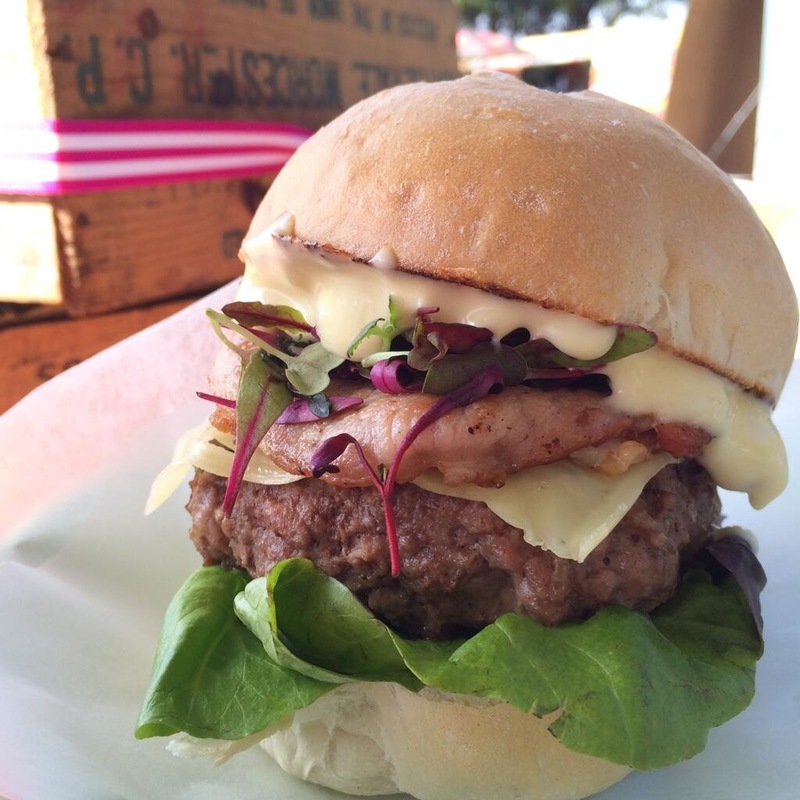 Once there, scout out The Counter, which specialises in gourmet burgers and brownies, both on sale at the market. 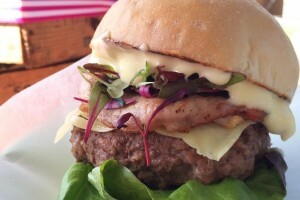 Run by two very passionate foodies who run a catering company fulltime, The Counter’s burger changes slightly every week, but usually is topped with bacon, cheddar cheese and greens. Can’t wait until Sunday? The Counter sells burger patties raw, for you to cook and enjoy at home. Make sure to save space for one of The Counter’s legendary brownies, which certainly have my vote as the best brownie in Johannesburg. The concept of Beefcakes was inspired by Miami’s South Beach in the 1950s, and in addition to the burgers being great, the drag-themed entertainment is a laugh too. 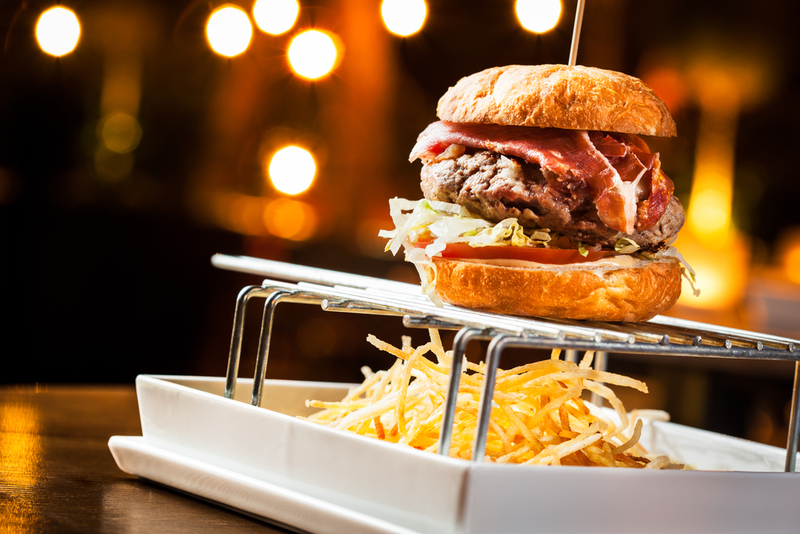 The perfect choice for a girls’ night out, this spot promises “good burgers and better buns” and features a different risqué theme every evening. You can expect to be given a feather boa on arrival, before you settle into a pink booth decorated with flamingos. Go on a Thursday evening for “The Dreemz Drag,” a Vegas-style drag show with songs and comedy. The menu is quite suggestive–try the “Nibbly Bits” starter (R140), which is delicious and great for sharing. It consists of a platter of beer-battered chilli poppers, nachos, crispy onion rings and gooey mozzarella sticks. All burgers are available in beef, chicken, lamb, ostrich or vegetarian, and you are also able to build your own: choose from a selection of tasty toppings including caramalized onion, home made tzatziki, marinated black mushroom or Mexican guacamole. Note: this is not the spot for a family lunch, and it is definitely not kid-friendly! Mon – Fri 12pm-10pm, Sat 6pm-11pm, closed Sun. Branches in Johannesburg and Cape Town.